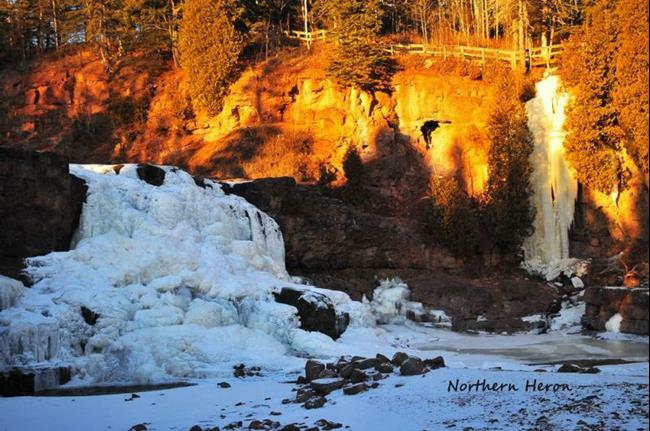 Gooseberry Falls is lovely any time of year, but I prefer to go when when the Falls are frozen. The area is a rough terrain, laden with several types of evergreens, as well as other species of trees growing out of the craggy rock.. The falls are roughly about one quarter mile from where they empty into lake Superior on the north shore, off of the famed "Hwy 61", a song Bob Dylan wrote in his early days. I happened to visit on this day during the Golden hour, that time of day just before or just after sunset/sunrise, when everything has a golden tone. The trees were on fire, the ice formations were fabulous, and it was one of my favorite visits to the park.